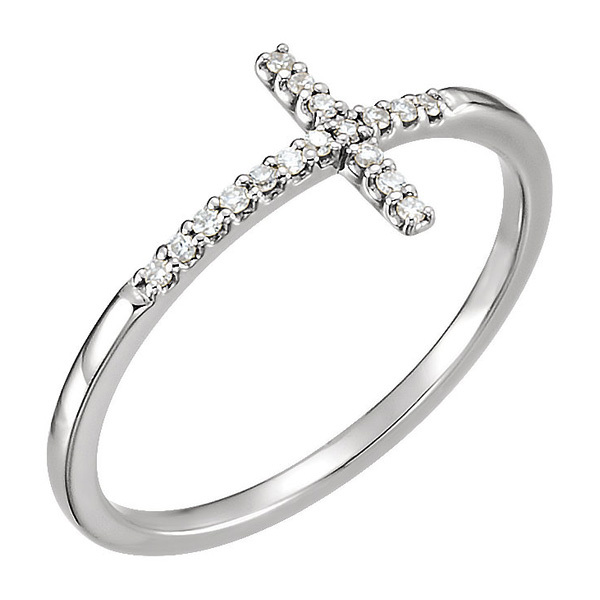 This beautiful and elegant women's diamond cross ring in 14K white gold from Apples of Gold Jewelry is definitely something more than a little special! Although this 14K white gold ring has a simple design, the seventeen diamonds make it elegant and beautiful. The diamonds total 0.08 carats, and the diamonds are rated G-H for color and I1 for clarity. The diamonds stretch along the band of the ring, which measures 1.6mm in width, and on the arms that stretch out from the center of the ring, forming a cross. We guarantee our Women's Diamond Cross Ring in 14K White Gold to be high quality, authentic jewelry, as described above.